A new update to the Android Wear app is rolling out now to version 1.5.0.308, but this one carries sad news for those of you who are using the Together watchface and its different features to closely communicate with a friend or loved one. Introduced about a year ago, Together was a way to pair your watch with a partner's and share sketches, photos, emojis, stickers, and activities. But with Android Wear 2.0's upcoming addition of more interactive watchfaces and messaging features, Together is no longer as unique as it once was. That's why Together is now living its last days. 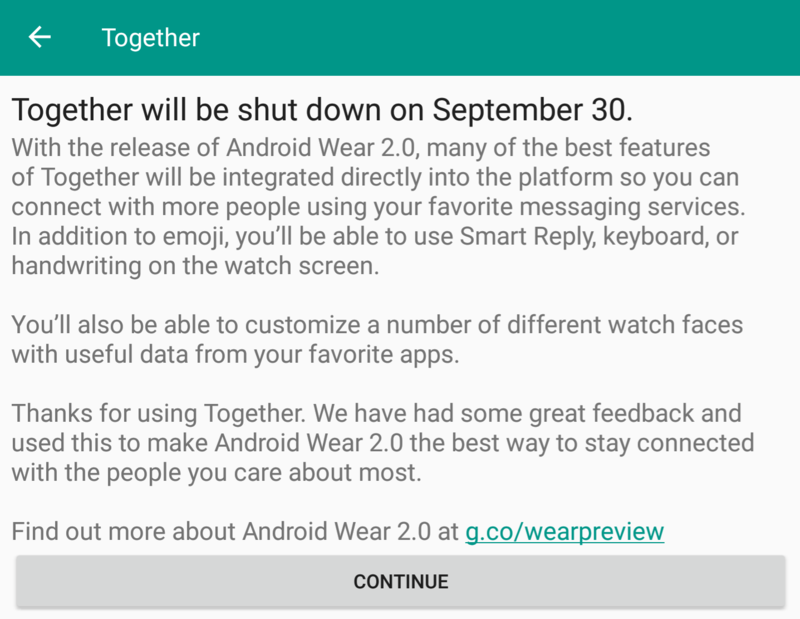 In the new Wear app update, you'll see a notice of Together being shut down on September 30, with the reason being its redundancy with Wear 2.0.